Not a lot, and only here and there. But, the San Benito River is beginning to flow beneath the bridge on Nash Road. And, the hills are starting to turn green. Thank you, Rain! Did you know we have a shop in our county that sells clocks, lamps, windows, tiles, ceiling plates, and other products made of colored glass? 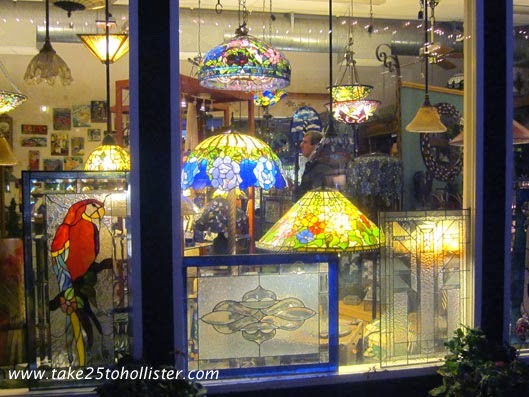 Walking by the shop one evening was what inspired me to look for examples of stained glass art in our area. If you're in San Juan Bautista, check out The Glass Connection. I hope you enjoyed the stained glass theme the past few days. Here are links to the posts, in case you missed them or want to revisit them. Enjoy the rain. Until tomorrow, Dear Readers. The building that was once the original Hazel Hawkins Hospital on Monterey Street has a few beautiful stained glass windows in its south wing. Notice how the glass is bubble-like rather than smooth? When the Husband and I stopped by a few days ago, we saw that the plates lining the ceiling of the hallway were ripped out. Too bad. It was an amazing sight to behold. I still wonder the inspiration for such a design. For those of you who never saw it, click here and scroll down to the bottom of the post. This small piece of glass work is on a back door. I like how at first -- and second -- glance the outdoors seem to be part of the window. In a way, it really is. Many churches in San Benito County have stained glass windows. Some artwork depict stories from the Bible, while other pieces are decorations. 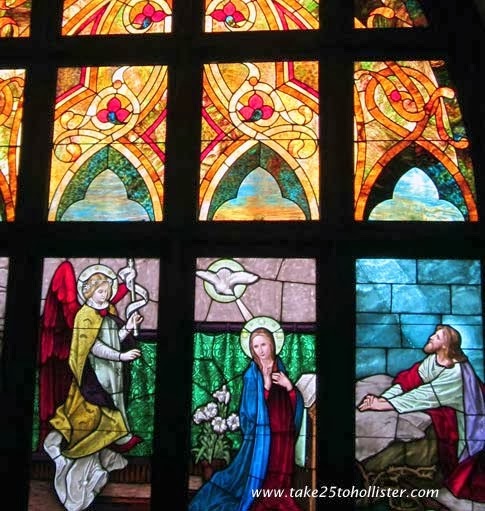 The photos on this page show two of the beautiful stained glass windows at the Hollister United Methodist Church on Monterey and Fifth Streets. 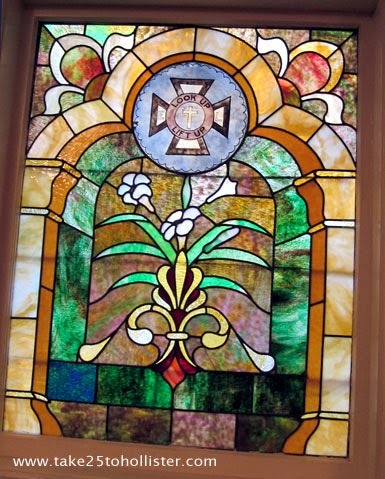 To see more church stained glass windows in our area, check out these pages. 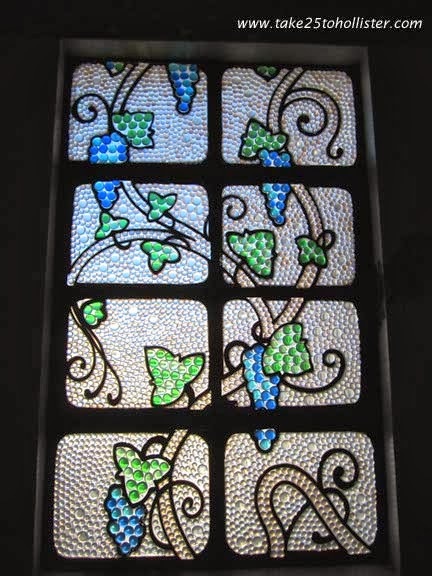 I wonder how the term stained glass came about that people thought it was uncool to say, "Wow! That's beautiful colored glass." Anyway, I've been noticing stained glass lately that I decided to feature some of the local sightings over the next few days. 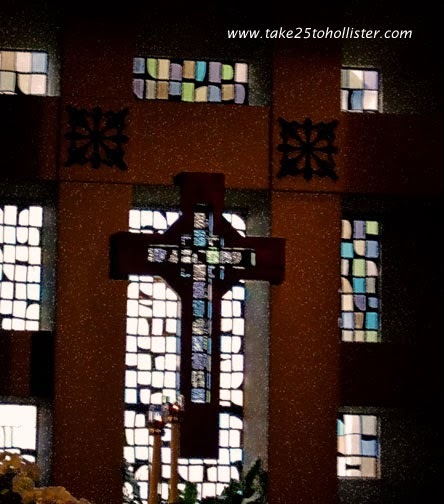 Today's photo shows some of the beautiful stained glass artwork at St. Benedict Church on Fairview Road. 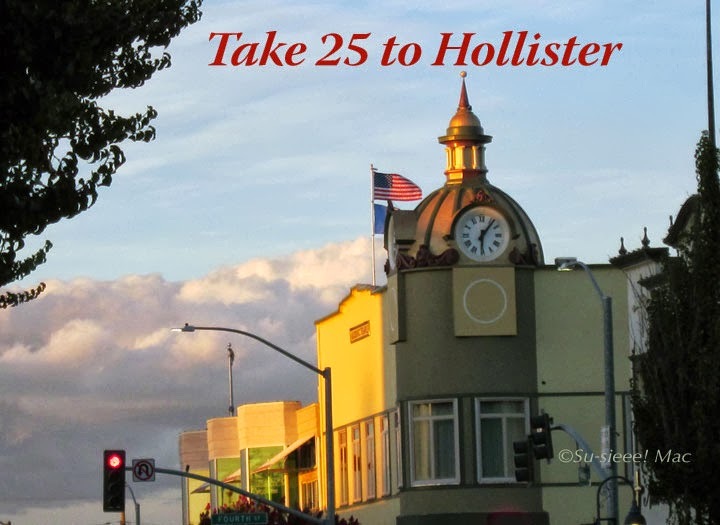 To see another piece at the church, go to this page on Take 25 to Hollister. 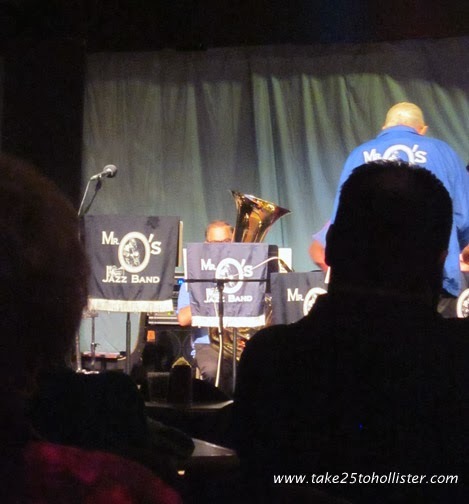 Last night, the Husband and I attended "A Night of Music" at El Teatro Campesiño in San Juan Bautista. What a joyful night! The event showcased many local musicians. The evening began with a premiere of Voices, the collaborative works of Emiliano Valdez and Michael Annotti, which they developed in partnership with Mr. O's Academy of the Arts and the San Benito County Arts Council. The songs of Mr. Valdez and Mr. Annotti were inspired by stories of many of the residents of San Benito County. One song, for example, was about working in the canneries. Their CD will soon be released. Playing out the night was Mr. O's Jazz Band, under the direction of Mr. Joe Ostensen. As always, Mr. O's band, composed of teenagers and adults, were grooving and moving the audience away. Queen sang, "I want to ride my bicycle." And, that's how I feel most days. 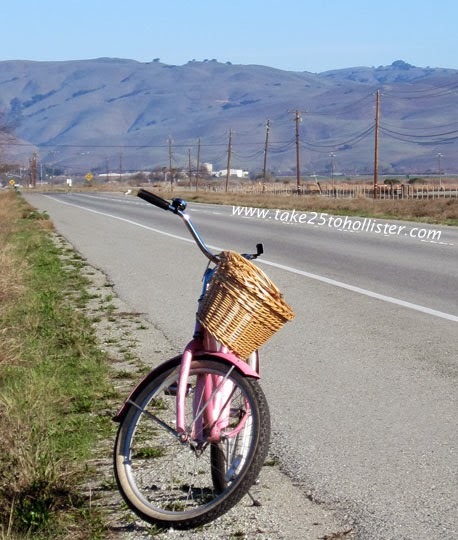 Hollister is a great place for pedaling around, whether it's up and down the back roads or through the neighborhoods. Even going up the hills is fun, because eventually you get to coast down. Wheeeee! The words City Hall are etched into the front of this building. 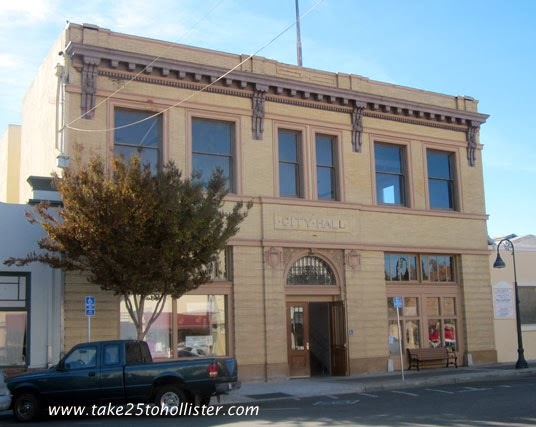 But, it is not the City Hall, although the city of Hollister now uses the bottom floor for some offices. Today's City Hall is a few buildings to the west—the white, concrete building that was once the Hollister City Library. In 1888, Daniel Gilmore of Arkansas bought several hundred acres of land in the Cienega Valley where he planned to create a plantation like the one he grew up on. To make it happen, he invited former slaves of his father's to move to San Benito County and work for him. 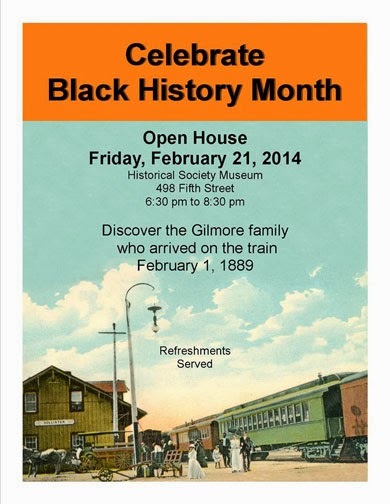 Gilmore was reported to have paid the train ride west for more than 40 men, women, and children who arrived in Hollister in 1889. 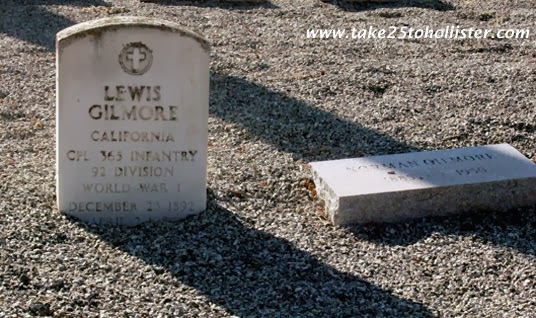 So, where did the name Gilmore Colony come from? I have no idea. 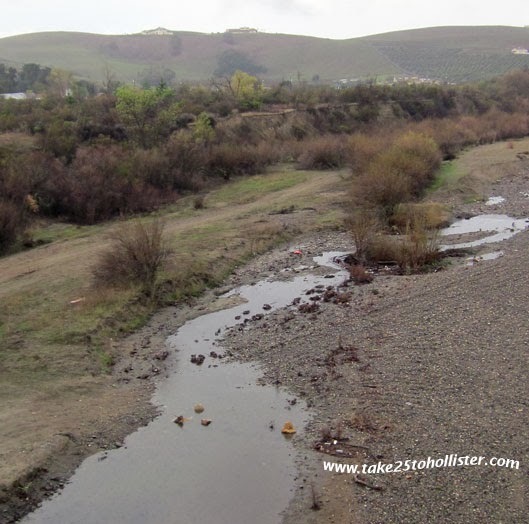 But, perhaps, it will be clarified at the presentation this Friday evening, February 21, from 6:30 to 8 PM at the San Benito County Historical Museum Open House on 498 Fifth Street, next to the library. 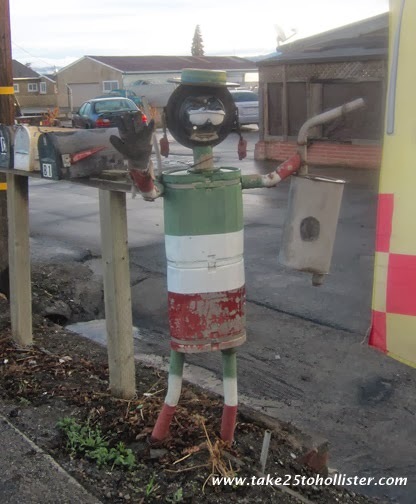 You can't help but smile when you see this piece of art waving "hello" from the side of the road. Haven't seen it yet? Look for it the next time you pass by 733 San Felipe Road, the building just after the Chevron Station. 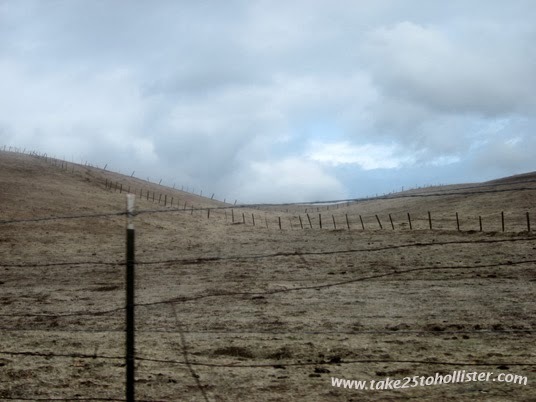 Poetry: Barbed-wire fence snakes up a hillside on San Juan Canyon Road. Some people like window shopping. Me, I like looking in windows to see what may be reflecting back. 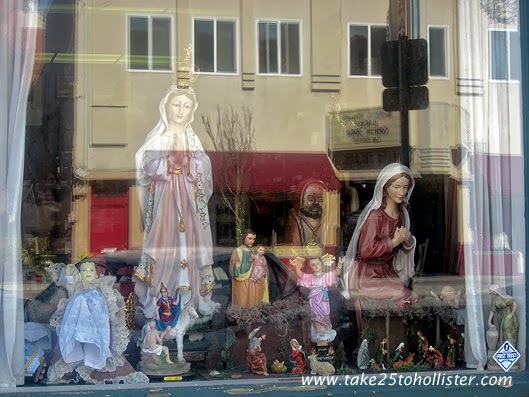 This display window belongs to Sharone's Religious Supplies and Gifts at 327 Fifth Street. Across the street is the building that houses the Granada Theater. 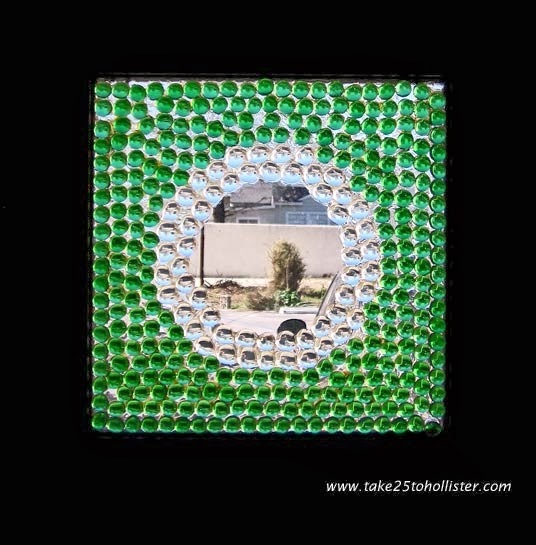 Here are a couple more photos of reflections that I took in downtown Hollister: This and This. 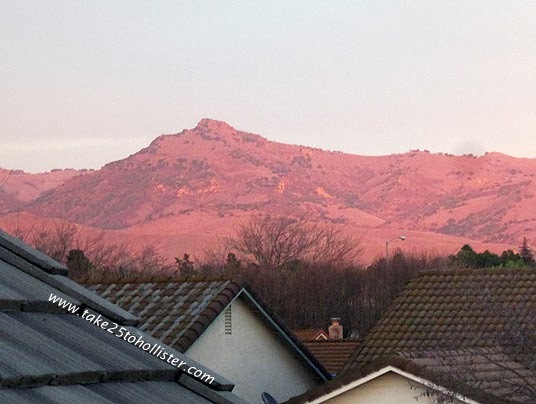 "Come look at light on the mountains," called the Husband yesterday evening, just before the sun set. 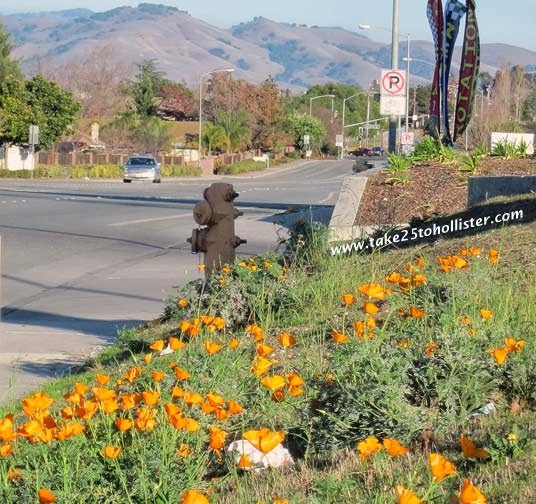 A few days ago, I saw my first golden poppies of the year. They seem to bloom earlier with each new year. Or, maybe I'm taking the time to notice things more. It's nice to know that California poppies are drought tolerant plants. We've had two mornings in a row of very thick fog. Is it unusual for February? I recall the summer mornings of fog around here when I was a kid many years ago. Fog that would break by 10 or 11 in the morning. Fog is nice. After all, we need precipitation in any form. 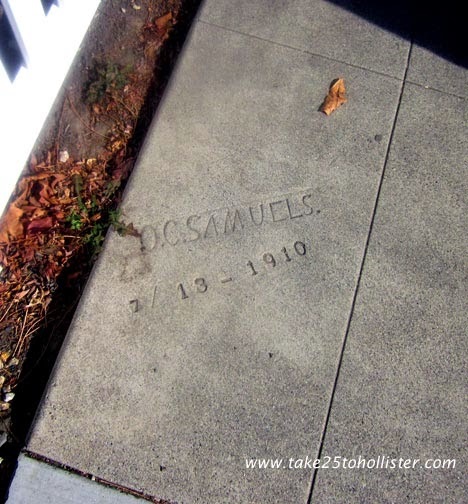 Some of the concrete sidewalks in the residential neighborhood of historical downtown Hollister were made in 1910. That's amazing, I say. Today, experts say that concrete generally lasts 20 or more years, if taken care of properly. The O.C. Samuels, the contractor, ought to be proud that his work has lasted so long. 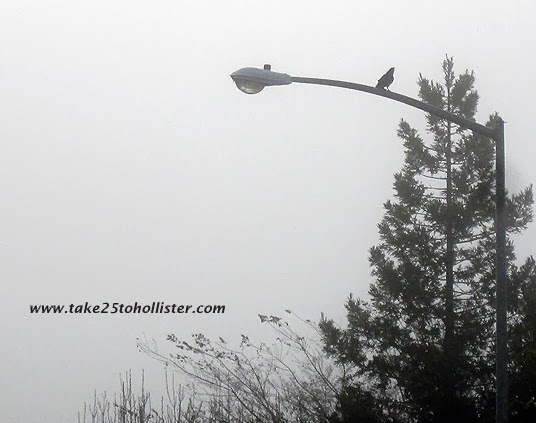 Have you been hearing or seeing crows a lot lately? I just read that crows like to roost in groups, particularly during the fall and winter. 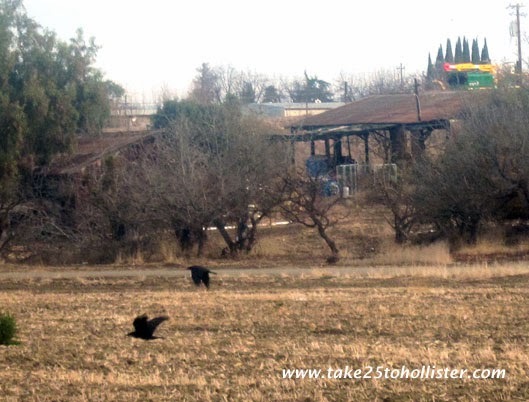 I've often wondered why there are so many crows hanging out in the orchards around Enterprise and Southside Roads. 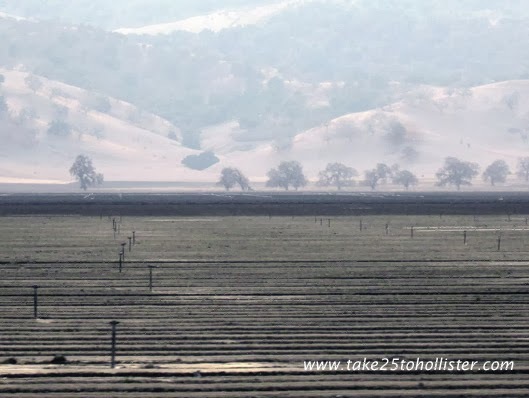 Hollister finally has its own source for earth-friendly products and it's called Gaia's Cottage. For instance, you can purchase locally handcrafted lotions and creams made from organic and non-GMO ingredients, Young Living carrier oils, glass drinking and baby bottles, watches made from sustainable and biodegradable elements, and local art work. 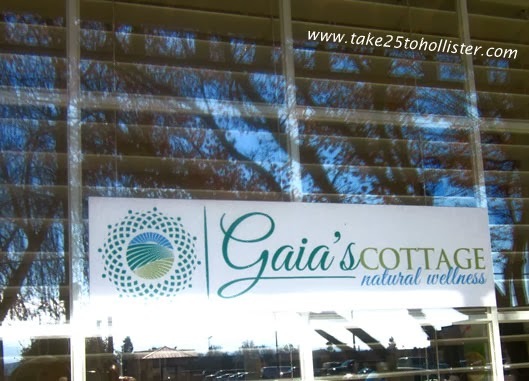 Located at 200 Tres Pinos Road, across from Gold's Gym, Gaia's Cottage is also a natural wellness center that offers yoga, massage, nutritional consulting, and more. To find out more, check out the Gaia's Cottage web site or its Facebook page. By the way, do you know what Gaia means? Gaia is the Greek word for Earth. In ancient Greek mythology, Gaia was Mother Earth. She was born from chaos, the nothingness of the universe, and gave birth to the mountains, the sea, and the sky. If you're looking for indoor things to do tomorrow (as it rains, hurrah! 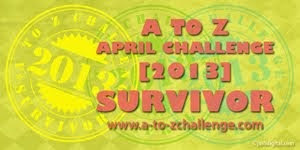 ), check out these two events in town. And, they are absolutely free! 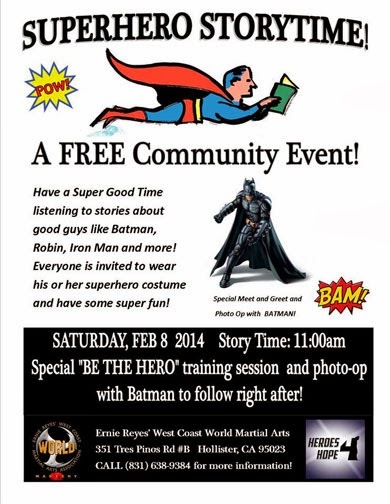 Ernie Reyes' West Coast World Martial Arts, at 351 Tres Pinos Road, is having a Super Hero Story Time featuring local storyteller Julie Engelhardt. Children and adults are invited to come in costume as Super Heroes. Special hero guest will be Batman who will be available to take photos with folks. Also dropping by are McGruff the Crime Dog and the San Benito County Sheriff's Department. That's right. It's a free Chocolate Tasting at San Benito Bene, 615 B San Benito Street, in historical downtown Hollister. C-h-o-c-o-l-a-t-e! Dark chocolates, milk chocolates, chocolate caramel popcorn, chocolate olive oil, chocolate truffles, chocolate pecans, and more. San Benito Bene will also be raffling a Chocolate Basket. Oooooh, yum. 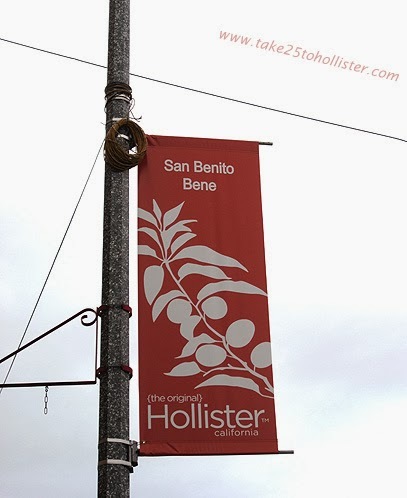 To find out more, check out the San Benito Bene web site or its Facebook page. Joy! Joy! Joy! 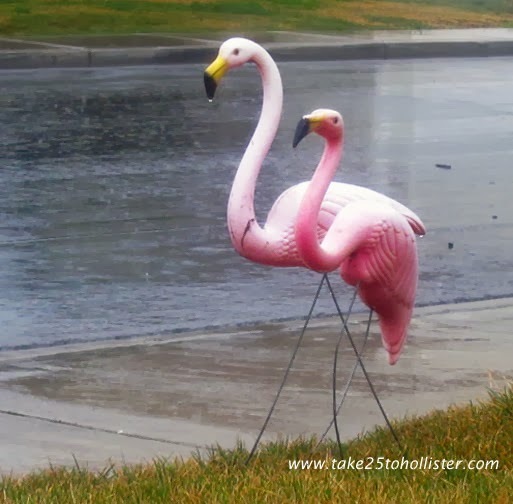 Yes, even the local flamingos are frolicking in the rain. 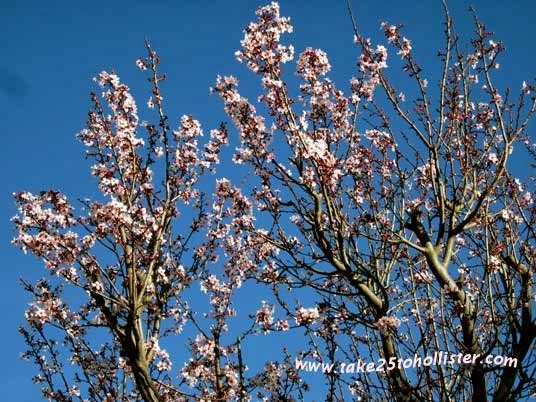 Weather forecasters say rain for the next four days. Whooo-hooo! 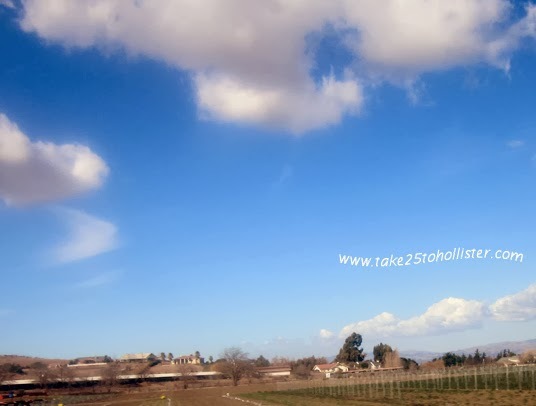 Want a great place to stay while visiting Hollister, San Juan Bautista, Pinnacles National Park, and the surrounding area? 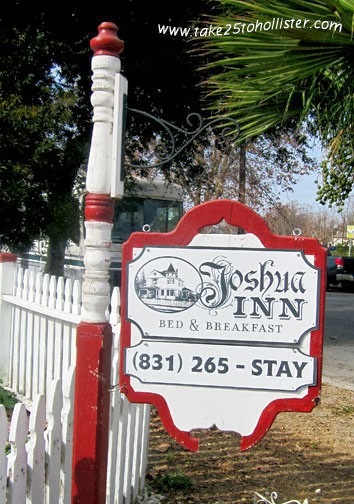 Check out the Joshua Inn Bed & Breakfast at 712 West Street in historical downtown Hollister, only two blocks from main street, aka San Benito Street. Joshua Inn, owned by Tricia and Greg Harvey, opened last summer. It's a gorgeous, happy yellow Queen Anne built in 1902. It was designed by the infamous California coast architect William H. Weeks and constructed by local builder Edward J. Sparling, according to The Historic Downtown Walking Tour booklet by Sharlene Van Rooy. The original owner was Judson Hamilton, who owned a harness and saddle shop in town. 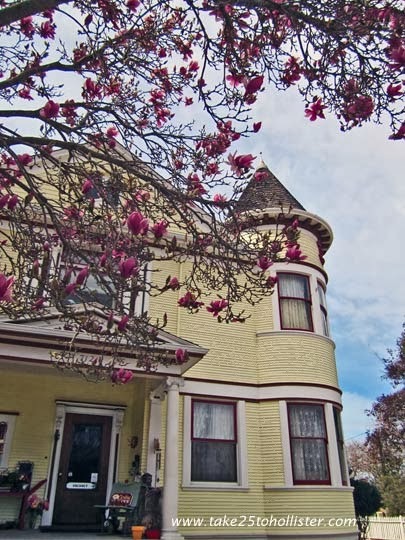 Right now, the B&B has four bedrooms available. Wouldn't you love to stay in that tower? For more information online, check out the inn's Facebook about page. 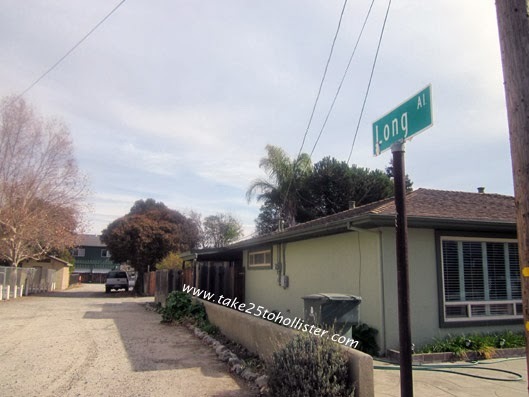 How short is Long Alley? It's half a block long! It starts (or ends) at College Street and ends (or starts) at McClure Alley. Still don't have a clue where Long Alley is? You know where the SDES Hall, aka Portuguese Hall, is on 7th Street. Long Alley runs behind it. The Husband and I wouldn't have known about this possibly shortest alley in town, if it weren't for taking a walk. Fresh, clear sky with the puffy clouds that come through after a rain. Rain, last Thursday. Rain, again, yesterday. Lovely, wasn't it? The Weather Channel forecasts chance of more rain for this coming Wednesday and Thursday. And, oooh, this is good, starting next Sunday, a chance of rain for four more days. Whoot! Whoot! Whoot! Keep on praying, channeling, thinking positively, and dancing that the forecast comes true, everyone! Yes! You read that correctly. From Monday, February 3, to Sunday, February 9, residents of San Benito County, as well as Monterey and Santa Cruz Counties, can get into the Monterey Bay Aquarium for free. All you need to show is a photo ID with your current address. Why such a treat? Because this year is the Aquarium's 30th Anniversary and as part of its celebration it's having this free-admission week. Whooo-hooo! 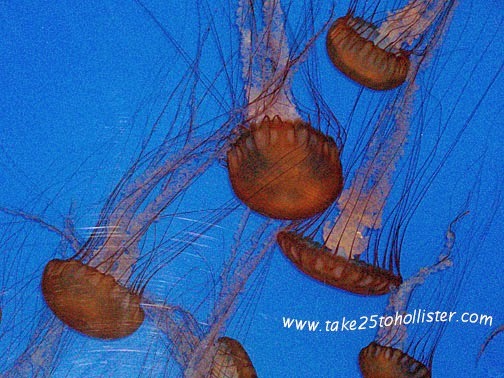 Congratulations, Monterey Bay Aquarium! And, thank you very much! Last Saturday at the Pinnacle Farmstand in San Juan Valley, this potato guy was smiling at us along with the young ladies who work there. 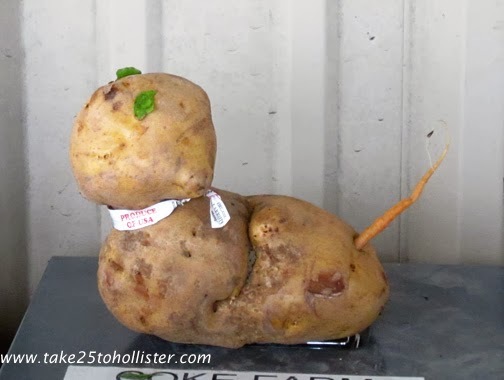 They, the young ladies, brought out the potato's personality with green eyes and a carrot tail. And, of course, they let everyone know it's a product of the USA. The Saturday farm stand is open until 1 p.m. today. 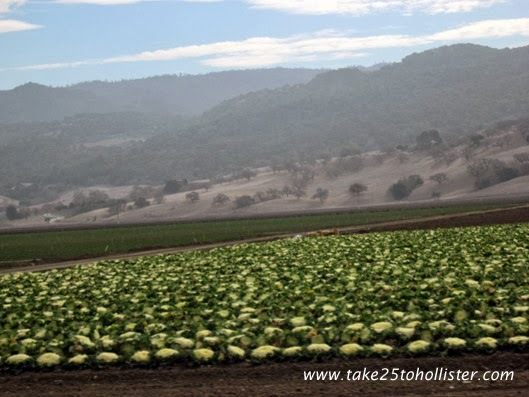 It's the only place in San Benito County that sells fresh, local organic vegetables and fruits throughout the year. Thank you, Phil and Katherine Foster!